This is the continuation of the publication „Polish fighting school”. Today we would like to present the third (and the last) part. At the beginning of the school year, the wave of support for parents fighting for their children’s right to learn in Polish arrived from Poland and organisations of Poles and of Polish diaspora. On 2nd September the Polish Minister of Education Joanna Kluzik – Rostkowska asked her Lithuanian counterpart, the Minister of Education and Science Audronė Pitrėnienė to revise the postulates of the parents of the pupils of Polish schools in Lithuania. On the next day Kluzik – Rostkowska wrote a letter to parents of the pupils of Polish schools in Lithuania in which she wrote: “I am also concerned”. On the first days of September, the Forum of Parents from the Polish Schools in Lithuania received a letter from Jolanta Tatara, the President of the Congress of Polish Education. “The Congress of Polish Education would like to express its support for the decisions made by teachers and parents to address the discriminatory policy of the government of the Republic of Lithuania concerning Polish schools in Lithuania” – the letter says. The Polish parents were also supported by the biggest social organisations in Lithuania: the Association of Poles in Lithuania and the Association of Polish Teachers in Lithuania “Macierz Szkolna”. On 3rd September the inhabitants of Vilnius received the news of an attempt to destroy a Polish school in the Jerozolimka district. We have already written that thanks to activity of the Polish communities, 6 secondary schools in the Vilnius region have been saved. Unfortunately, the government of the city, with the mayor Remigijus Šimašius at its helm, managed to close the Polish school in Jerozolimka. Parents were forbidden to apply and the school was forbidden to accept any applications. Because of the activities of the Vilnius local government, Strike Committees of the Polish Schools in Lithuania, the Forum of Parents from the Polish Schools in Lithuania and the School Defence Committees have issued a statement concerning the destruction of the Polish primary school in Jerozolimka. “We are against the destruction and closure of the historic primary school in the Jerozolimka district on 1st September 2015. The parents were under psychological pressure to apply to take their children away from the Jerozolimka school. Liberal-conservative coalition is trying to close down another Polish historic school in Vilnius. They are intimidating and manipulating parents by administrational means” – the statement reads. The Polish parents emphasised that the closure of the school would mean depriving many Polish children from families from several districts of Vilnius of the opportunity to learn in their native language. “We want the responsible to be punished for their unlawful activities. The closure of the Jerozolimka school means depriving inhabitants of Verkiai, Santoryszki, Bołtupie and Jerozolimka district of the possibility to learn in the Polish language” – the parents openly express their concern. The authors of the statement demanded that the new primary school be opened in this district. “We want the new primary school to be opened in Jerozolimka, in a separate building and with its own administration. The primary school in Jerozolimka is needed – it can be seen in the number of parents’ applications and the fact that 20% of Poles live in the district. The primary school in this part of Vilnius has to be reopened immediately. We would like to protest against the discrimination of Polish children in Verkiai, Santoryszki and Bołtupie” – this statement was sent to the President Dalia Grybauskaitė, the Prime Minister Algirdas Butkevičius, the Minister of Education and Science Audronė Pitrėnienė and to the Mayor of Vilnius Remigijus Šimašius. “We fought, we are fighting and we will fight” – Polish parents in Lithuania are determined to fight for the future of their children. The Poles organised a protest in front of the building of the Ministry of Justice. By participating in the protest, the parents and the grandparents of pupils tried to draw the attention of the Minister of Justice Juozas Bernatonis to possible unlawful and biased decisions of the judges of the Supreme Administrative Court of Lithuania. The Polish parents doubt the impartiality of the judge of the Supreme Administrative Court of Lithuania Irmantas Jarukaitis – the leader of the panel of judges whose decision was unfavourable for the Polish Szymon Konarski Secondary School in Vilnius, they suspect him to be connected to the mayor Remigijus Šimašius. On 11th September the German minority in Poland expressed their support for the Polish minority in Lithuania fighting for their schools. “With increasing concern we observe the situation of the Polish “minority” schools in the Republic of Lithuania and we would like to express solidarity and support for the Polish national minority in Lithuania who has to resort to such radical measures as strike to defend its rights.” – we read in the statement issued by the Union of German Social-Cultural Associations in Poland. “Mayor R. Šimašius, why do you want to throw the teachers on the street?”, “Equal rights for all!”, “R. Šimašius, what have we done to you?”, “Mayor, don’t use Bolshevik methods!” – such captions could be found on banners held by teachers from Polish schools in the capital during their protest on 15th September in front of the Vilnius Town Hall. Standing with their posters in front of the Town Hall, they protested against the reorganisation of schools, which discriminates against the minority schools and against no law concerning the pupils of the 11 – 12 grades and their teachers from the Szymon Konarski School which is threatened by degradation to a primary school status. On 2nd October the Polish parents organised another demonstration, it took place in front of the building of the Supreme Administrative Court of Lithuania. The parents protested against its biased judgement concerning the Szymon Konarski School. On 16th October 4 000 people gathered to express their opposition in front of the building of the Government of Lithuania, the manifestation was officially supported by the Electoral Action of Poles in Lithuania. Such number of protesters wanted to express their defiance against the unfair social and educational policy of the country. The protest was organised by representatives of work teams, trade unions, communities of education, culture and social workers and parents of pupils of Lithuanian and minority schools. During the manifestation, a Member of Lithuanian Parliament, the Head of the Association of Polish Teachers in Lithuania “Macierz Szkolna” Józef Kwiatkowski spoke about the education of national minorities. He said that national identity was one of the most important values to teach to our children and it can be guaranteed only by school teaching in the native language. “That is why we want the national minority schools to achieve such status, we want the native language to be respected and to be used during state exams and lessons of history of the home country”. – he said. The destructive influence of the reform on the schools of national minorities was also mentioned. Demands of justice in education were also included in the petition handed in to the Prime Minister by the organisers of the protest. 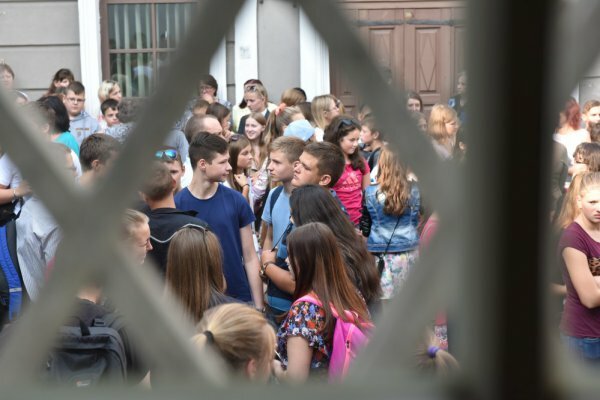 On 20th October the District Administrative Court in Vilnius announced its verdict concerning the future of the Szymon Konarski Secondary Schools. The decision disregarded the arguments and pleas of the school community to retain its secondary school status and avoid degradation. Among many unhappy events, there took place a happy one – an award ceremony in the 21st edition of the “Best school-best teacher” competition, organised by the Association of Polish Teachers in Lithuania “Macierz Szkolna”. It is a happy event but a hint of sadness can be felt as well. The feeling of sadness overshadowed the ceremony, because, according to the Head of “Macierz Szkolna” Józef Kwiatkowski, the government “does not always cooperate with the Polish schools in Lithuania”. What is good is the fact that despite difficulties the teachers and administration of the Polish schools in the Vilnius region “work very hard and the results are really good”. In this year’s ranking the best Polish schools in Lithuania are: the Józef Ignacy Kraszewski Gymnasium (in the category of Vilnius schools), the Konstanty Parczewski Gymnasium in Nemenčinė (in the category of schools in regional cities),the Józef Obrembski Gymnasium in Maišiagala (in the category of schools in the Vilnius region) and the Michał Baliński Gymnasium in Jašiūnai (in the category of schools in the Šalčininkai region). During the ceremony, 14 schools were awarded with a diploma with distinction and 5 establishments were praised for their activity in competitions. Awards went to 77 teachers of: Polish, Lithuanian, English, German, Russian, History, Geography, Mathematics, Biology and Chemistry, IT, Physics and to the teachers of early grades. Protests, manifestations, petitions, appeals – all of them, combined with the Poles’ determination helped save 6 Polish secondary schools in the Vilnius region. Unfortunately, the problems with schools in Vilnius itself haven’t finished because of unfavourable decisions of the local government. The history of Polish education in Lithuania and its difficult experiences of the past make it clear that the current Polish education system does not and will not have an easy life. Despite witnessing different period of the Lithuanian history, different historical turmoils and the changes of rulers and regimes, the Polish education always faced those threats. It seems that this tendency is not going to be reduced and the Polish educational community in Lithuania is going to be tested again. The fighting makes sense if we know what we are fighting for, it gains the fundamental value then. Polish schools in Lithuania are one of basic conditions for survival of Polishness in the country. The attackers know about it, but the fighters, the Poles, are aware of it as well. This knowledge, innate endurance and faith in victory are the driving force of the Polish community. History makes us think that we will never run out of it. This project is funded by Polish Diaspora Funds of the Polish Ministry of Foreign Affairs.